They're big in Japan, and they're making a huge impact on this side of the world. Make way for One Ok Rock! 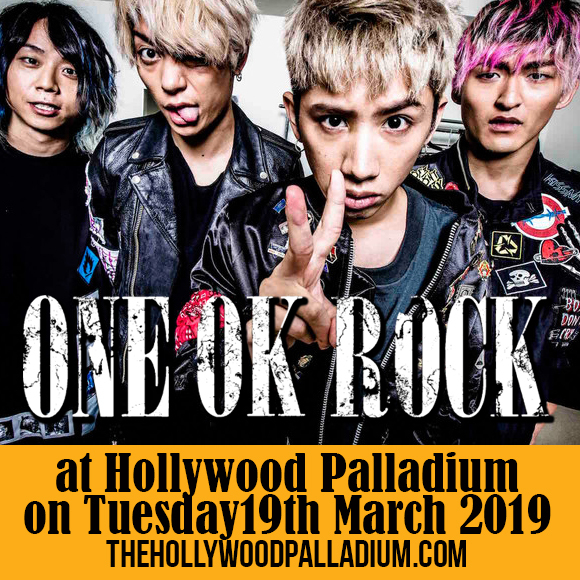 This Japanese alternative rock band is all set to rock the Hollywood Palladium on Tuesday 19th March 2019. Their punk rock-oriented sound, plus the fact that they sing in English, made it possible for them to break on through to rock music fans on this side of the world. The excitement is in the air! For an act who have come this far, fans will not just sit around till the last minute to get their tickets. Don't say 'sayonara' and just let this moment pass you by. Click ' buy tickets' and say 'ok!' to the rock-tastic time in store for you as you rock on with One Ok Rock! Japanese alternative rock band One Ok Rock has definitely come a long way since their one-o-clock in the morning band practice sessions, as they were scrimping to get cheaper studio rates. Hence, that's how the band got its name. As the riffs of their punk-influenced sound reverberate to distant shores, One Ok Rock is now practicing and playing on different time zones. They're now traveling to various parts of the globe, playing to audiences of varying nationalities. Their international success brought them to major music festival stages like Vans Warped Tour, where they were lineup alongside Linkin Park and A Day To Remember; as well opening act opportunities for the likes of Yellowcard and 5 Seconds of Summer. Toru Yamashita, Ryota Kohama, Alex Onizawa, Yu Koyanagi and Taka Moriuchi were still a bunk of high schoolers in 2005 when they got together and formed One Ok Rock. In 2010, they scored their first Top 10 hit with "Kanzen Kankaku Dreamer." The following year, they were playing at Japan's most prestigious music festivals: Rock in Japan, Summer Sonic and Rising Sun Rock. In 2013, they broke into the international scene with the release of the album “JinseixBoku=“, which remains their biggest seller to date. Now signed under the worldwide indie label Fueled by Ramen, One Ok Rock is on to their eighth studio album which is available in both in English and Japanese, and features duets Avril Lavigne and 5 Seconds of Summer. Set your alarms and save this date: Tuesday 19th March 2019. Something to give you a jolt for the rest of the week!